Catches are updated during weekdays, Mon-Fri during office hours 1 pm - 5 pm. Catches marked with an asterisk (*) are put back. 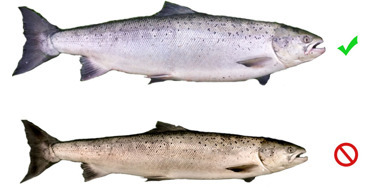 Spawned salmon and sea trout must be returned into the water alive. 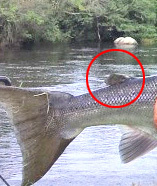 Do not lift spawned fish out of the water to measure, weigh or take a photo of it! The same apply to all fish put back. Registered catches without fishing license number or where you caught the fish, will not be registered. Neither will they be able to win a season-license after the season. A maximum of 3 catches per person and day are included in the catch report. The license numbers on the cards are found at the bottom right of the card. If you have purchased 1-day- or a 3-day license online via Relax Fishing Sweden, fill in your reservation number instead of the license number in the catch report. It consists of four letters followed by two digits, eg. ABCD12. Adipose fin marked with a circle. Salmon with its adipose fin intact, is recommended to release back into the wild. Catches marked with an asterisk (*) are released back. Laholms Laxfiske has the right to at any time during season, clear out inaccurate catch reports.